Next Sunday, April 7th, is the 111th edition of Paris-Roubaix, a Classics Monument that has nearly as many nicknames as editions (Hell of the North, Easter Race, A Sunday in Hell, etc.). I have ridden most of the cobbled sections up there and I can tell you that there’s a reason for the hellish monikers (even though the original name comes from the aftermath of WWI in that area, not the race). It is one of the most demanding and fatiguing things I think I’ve ever done – like pedaling a jackhammer, more or less. The burning question this year, like in years past, is who the heck can hold the wheel of Fabian Cancellara when he turns on the gas on the cobbles? Boonen is out (isn’t he? ), Sagan is taking a break till he visits the podium again in the Ardennes Classics (keep your hands in your pockets, young man). Unless the race ends in a bunch sprint I don’t see anybody taking it to Fabian. But that is in my perfect world, where the Arenberg Trench doesn’t exist, for example (mostly because I want to forget it). Anything can happen in this killer of a race. And don’t tell me how it turns out – I have to watch the re-run because I have my own Hell to attend to on that day. 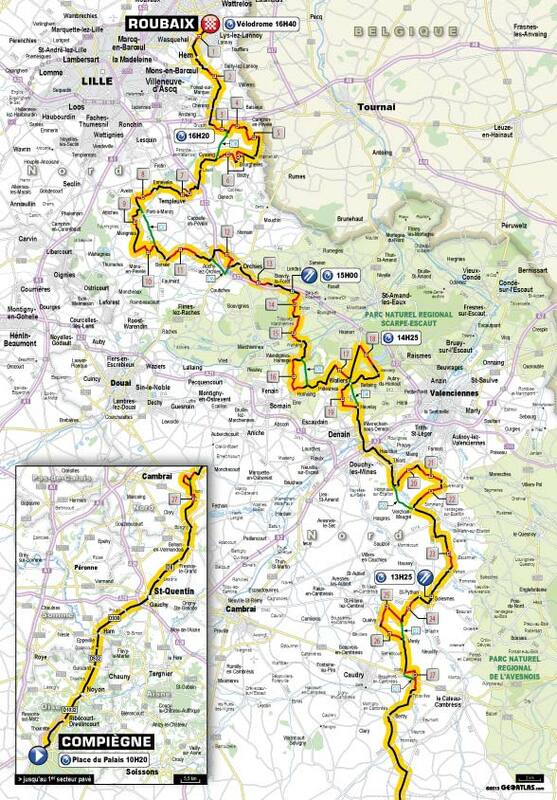 This entry was posted in Cycling and tagged fabian cancellara, paris roubaix 2013 route map, peter sagan, Tom boonen. Bookmark the permalink. I’ll be at the Arenberg! I’m jealous. I was there in ’11 and it was a hoot. I am collecting them this year – got to justify moving to Belgium. Kevin, I was just about to starting reading your blog to see why you are able to be there for both the ToF and P-R. Now I know…but I’ll read the blog anyway!